Crude oil retreated $0.28 to close at $99.48 yesterday, moving lower early with markets in fear of further contraction in Chinese manufacturing. Brent fell on China as well. We should get a fresh STEO out of EIA later today and we'd expect them to move their US production number back up from 8.4 to 8.5 MM bopd either today or next month. This morning crude is trading flat. Natural gas inched up a penny to close at $4.69 yesterday, staying buoyant despite another larger than 5 year average injection on the way this week as traders look for warmer temps to begin to push up cooling load. We continue to expect some near term softness. This morning gas is trading up five cents. 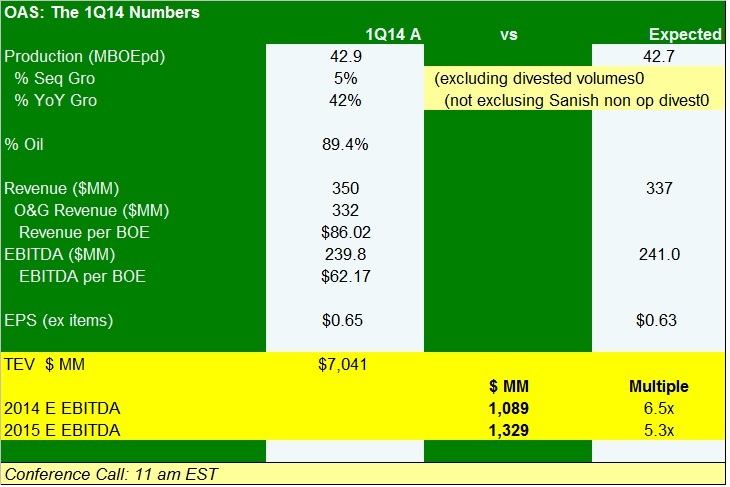 The 1Q14 Numbers: Essentially in line volumes and good cost control yield inline to slightly high EBITDA and EPS. EBITDA margin is still low for a Bakken player but should travel higher now as additional volume growth kicks in. Guidance: Going up as expected. Exit rate was boosted from New guidance has been boosted from 4,250 BOEpd to 4,900 BOEpd as they are now officially going to 4 rigs in late 3Q14 (read minimal impact on 2014 volumes but a head start for 2015) and will have more wells drilled than was the plan at the beginning of the year. 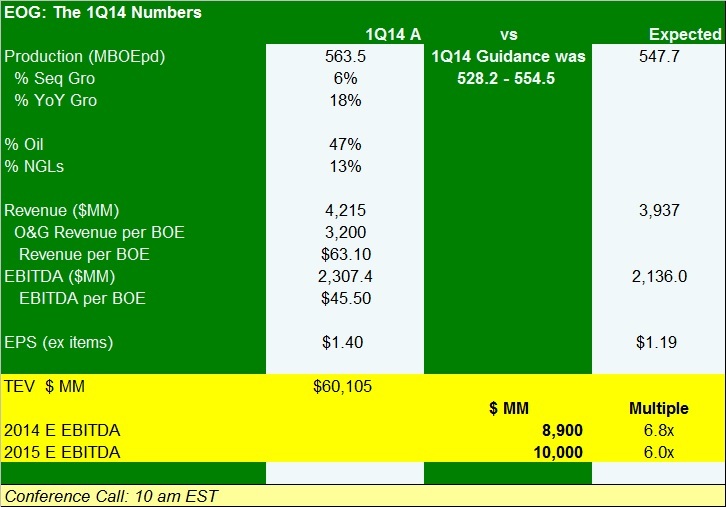 2Q14 guidance is now 3,500 BOEpd, just above the Street at 3,400 BOEpd and we'd expect near and out quarter numbers to move up as our sense is they are bagging a bit in the out quarters. Low Rider (McKenzie County, ND) estimate recoveries upgraded from 550 to 600 MBOE, as with production guidance this was expected. Revolver increased from $75 to $100 mm, which should leave them with plenty of liquidity ($296 mm including cash) to carry them well into 2015. Well Update: see table below with yellow highlights. Note that 6 months out, their average well has cumulative production of nearly 91,000 BOE and their longest running operated well has surpassed 131,000 BOE in 9 months (those are good wells for McKenzie and will lead to payouts in less than 18 months. Also not the consistency of the results. Valuation remains quite compelling given the strong growth, consistent drilling results and if it sits at current levels for long it will look exceedingly cheap for an operator. 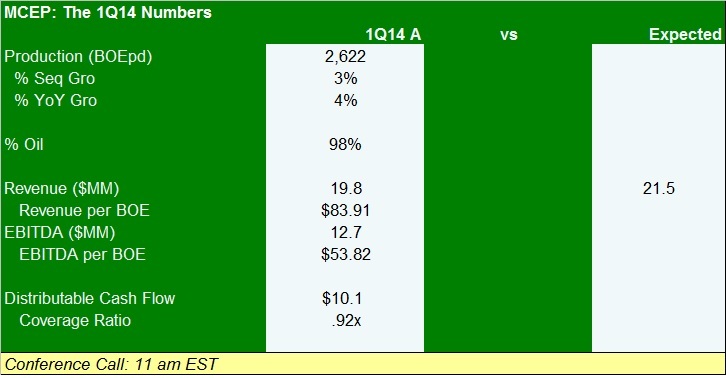 Nutshell: Pretty much an as expected quarter from a quarterly numbers and guidance extent. The $93 mm boost to the capital program may prompt a little indigestion with some but our thought is they are still an early stage in a maturing basin and are playing a bit of catch up. Estimates will likely rise slightly on the guidance (we expect the Street to continue to see it as conservative and our own estimates remain about 200 BOEpd for the year above the current Company/Street without the benefit of adding a 4th rig to the program. 2015 numbers will be heading noticeably higher and we'll put new ones out once the quarter settles down a bit (next week). Probably around mid 2015 they will need additional external financing (they're funded for 2014), likely in the form of a combination of debt and equity. For 2014, they look covered by cash, revolver capacity and cash flow. We continue to own the name as a top 10 position in the ZLT and in the ZLT G accounts as well. We'd expect to move up modestly on the guidance and well results. 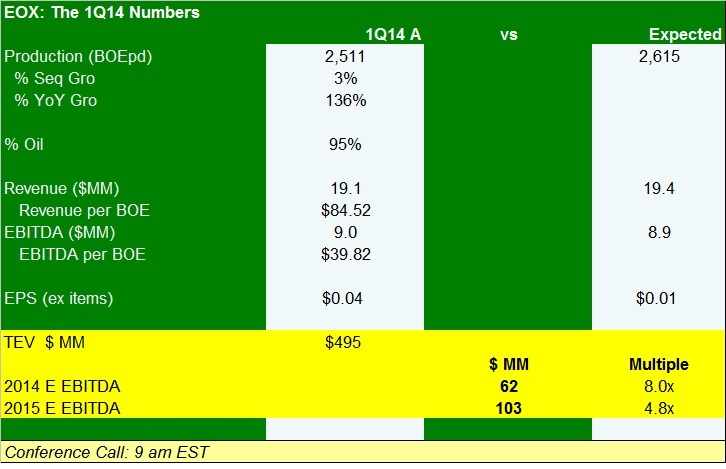 The 1Q14 Numbers: Production came in well above guidance. Oil hit its highest percentage of the mix yet at 47% driving total liquids to 60% and EBITDA per BOE to a new quarterly high at $45.49. 2014 guidance moved up to a range of 551 to 595 MBOEpd vs prior guidance range of 547.2 to 591.3 MBOEpd, equating to growth of 12% YoY on the mid. The increase was oily in nature and takes expected growth from the old 2014 target of 27% to 29% oil growth. South Texas - Eagle Ford - More monster sized wells in the EFS, and specifically in Gonzales which should put upward pressure on names like PVA. We won't run through the list this quarter but again, it's a more than solid showing. They expect to be HBP'd by mid year and continue to see further efficiencies that will drive completed well costs lower. Testing tighter spacing (down to 700'), based on others in their core it should not be a problem. In Reeves County they announced some OK looking Wolfcamp wells. Look for more color on these on the call. New Ventures: They see a combined 400 MMBOE of new potential in 4 zones in two new (as cores go for them) Basins. Codell - Laramie County, WY (Codell) - 72,000 net acres in "sweet spot", first five wells had IPs from 9,000' laterals of 1,294 BOEpd with cumulative production from the first well of 73,000 BOE in its first 3 months of life (really strong). Handful of wells drilled so far with plan to drill 13 this year in a 1 well program. Look for details on the call. Turner - 63,000 net acres, two IP's given, both just over 1,000 BOEpd with roughly 70% oil (not mix in their figure in the pr does not match rates given in presentation which the play to less oily by about half). The 2014 plan is to drill 28 Parkman and 6 Turner wells this year. Look for more questions here on this one as these are not household horizon names. Balance Sheet: In the best shape its been in in modern history (again). Total debt basically held flat for a 6th straight quarter while net debt continued to fall. Net Debt to LTM EBITDA is now only 0.5x an net debt to cap is 19%, well below EOG's long term max rate target. Look for questions regarding acceleration vs further increases in the dividend or even significant buybacks on the call (doubtful on the buybacks but it's a worth cash use question as they grow). Nutshell: Monster quarter. Guidance increase adds fuel to the fire as do the addition of two more oily plays and the words "transfer of skill set" will be typed many times over the next 24 hours. Look for lots of questions on the impact of the DJ and Powder River Basin programs (along with costs of those wells) during the Q&A portion. As always, look for good macro oil and natural gas color on the call. We continue to own the name in the ZLT and have been thinking to add to the position on weakness ... which we are not likely to get today as price estimates and price targets will traveling higher before and after the call. 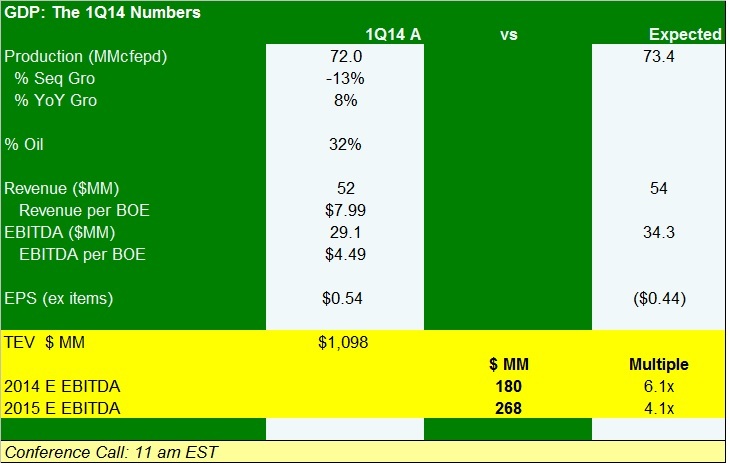 The 1Q14 Numbers: EBITDA margin rises to best level seen yet as oil mix continues to improve. LOE remains well in hand at just $5.28 per BOE despite increasing oiliness. First well, the Rector in Guernsey, OH, produced 57 MBOE in first 113 days prior to shut in for infrastructure. Nice. Second well, the Brown, also Guernsey, to spud during 2Q14. Expect results on the 3Q call. Acreage now stands at 25,700 net, up from prior 21,700. Lastly, they noted that they are not including Nio A in their location counts but have been encouraged by what they've seen in the A. Production up 14% sequentially at 44.5 MM/d but not a real focus for the name at this time as their area remains infrastructure constrained. They did note some relief on that front saying that April production averaged almost 60 MM/d (vs productive capacity of 70 MM/d). Balance Sheet: Fine with net debt to TTM EBITDA at 1.9x and net debt to cap at 48%. Revolver was increased by $100 mm to $570 mm. Nutshell: Nice beat, all systems go. Estimates will be moving up and our view is that given the rapid and expanding growth of the oil wedge in the volume profile that the name remains a bargain despite the recent run in the shares. We continue to own a full Core position in the name in the ZLT. 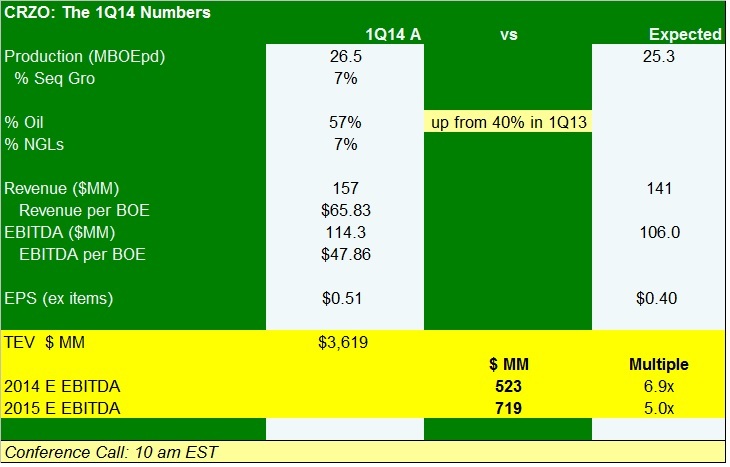 The 1Q14 Numbers: EBITDA was down sequentially due to lower commodity prices and hedges that worked against them during the quarter. Coverage was below 1.0 in the quarter at 0.92. Guidance: None as per usual. Coverage below 1 due to increased number of units for an acquisition that didn't exactly line up in terms of cash flow contribution during the quarter. They acquired another 90 bopd in May that will be additive to the 2Q and forward numbers. We'd look for larger deals before year end 2014. Nutshell: We entered the name in January 2013 at $21.41 and have not added more since. It's not really our kind of name (enhanced oil recovery vs growthy E&P) and while we've liked the increasing distribution (every other quarter or so) . We continue to own a small position in the name in the ZLT. OAS Reports Solid 1Q14 Results; Highlights improving wells due to change in completion method. The 1Q14 Numbers: Volumes were up about 5% excluding divested volumes and the company had previously said look for a flat quarterly number due to weather. LOE per BOE was above trend for the quarter due to weather related workover but that's going to be the case with all of their peers and it will back down as volumes ramp into 2Q and 2H14. No change to full year guidance for them at this time which is normal for them. They reiterated cost guidance saying they expect LOE to get back in line, fall from 1Q14's peak albeit they see it coming in at the high end of the guidance range. Noting they have seen a whopping 25+% uplift in well production (didn't quantify or clarify over what period) due to slickwater fracs and said they will be going to 60% new methodology completions (slickwater and other changes) for 2H14. Also noted that despite the harsh weather, average CWC has now fallen to $7.2 mm per well and they see room for further improvement. 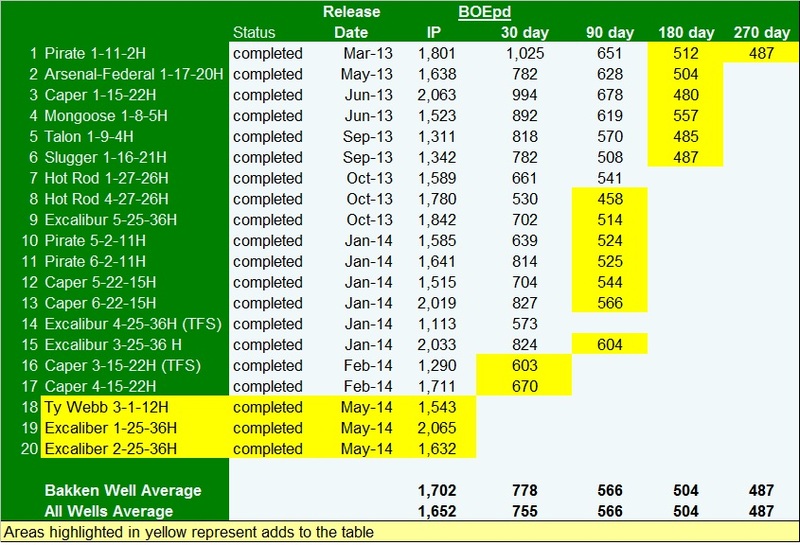 Backlog of wells awaiting completion has risen 47 wells awaiting completion and a 16th rig to arrive soon. Balance sheet - improved after recent equity offering with net debt to TTM EBITDA at 2.5x. Nutshell: Solid quarter despite the weather. They generally don't give a lot of details in the quarterly press releases and the commentary on the move to slick water fracs is about as exciting a thing as we normally see out of them. The name remains cheap in our view at 6.5x TEV/'14E EBITDA and 5.3x next year's number in light of continued strong forecast growth this year and next and a move on free cash flow land in the offing this year. We continue to see their full year guidance as conservative and would expect them to boost guidance fromthe 40% YoY growth areas to closer 50% with the 2Q14 or 3Q14 call. We continue to own the name as a top 3 position in the ZLT. TMS - last 2 wells were lower TMS target wells and noted the Blades well had 2 mm pounds of extra proppant in it and used composite (more easily drillable) plugs, their latest design. Drilling next well and will spud next two shortly. Balance Sheet: Borrowing base reduced to $250 mm "primarily due to lower bank deck natural gas pricing". That's an odd comment. Nutshell: Miss but our sense is the quarterly numbers are likely to get fleeting notice at present as more TMS color is just around the corner. We do not own the name at present. The 1Q14 Numbers: They don't guide for quarters but volumes were in line with their own expectations (both EFS and Permian were up sequentially) and the fact that they missed is due to Street exuberance with the shape of production growth this year. Notably, cash margins step back up close to recent highs from mid 2013 when oil prices were quite a bit higher than this quarter just past. Guidance: No change, still looking for 20 to 30% growth, no change to budget either. Permian - 900 net locations, roughly double levels from the end of 2013 as they continue to delineate in Reeves County. Permian - Increasing focus on horizontals they put 4 to 5 rigs to work drilling horizontals in 2Q14 that will target: a) a lower WC well, b) a 3rd interval Bone Springs well, c) a 3 well spacing tests and d) a long lateral WC A test. Eagle Ford - not a lot of detail in the press release. Look for them to talk about the results of multiple stacked lateral upper and lower EFS tests on the call. New Ventures - nothing mentioned and we'd like them to keep it simple a little longer. Budget is running a little front end loaded due to more rigs than the year will average, running in the EFS but they did reiterate they plan to stick to the $1.1 B forecast. Nutshell: Solid quarter despite the miss. We continue to own the name in the ZLT. They'll probably talk about timing on a test of their northern most slug of acreage, Twin Lakes on the call. . Looking for direction on the call for the San Juan oil program and Niobrara high pressure gas well program in the Piceance. Looking for more data on the initial Howard County discovery well and additional wells there. Still getting to know them but as we've stated repeatedly, we like the way they present and thing this quarter likely puts them in the easier to own category of ZLT names. This entry was posted on Tuesday, May 6th, 2014 at 7:18 am	and is filed under CRZO, eog, EOX, GDP, MCEP, oas, rose, Uncategorized. You can follow any responses to this entry through the RSS 2.0 feed. You can leave a response, or trackback from your own site. FST taken out by Sabine, all stock… Was watching this one in the hopes it might rebound. It is better off getting bought out. Good acreage. Miserable leadership. re 5 – thanks, happy to have avoided them all these years. As Reef said awhile, net of debt no value, so getting taken out far under most people's average cost. Today's post is open to the public, please feel free to share the link about the internet to help keep subscription prices down. EOX call about to start, notes in a bit. OEDV on the tape announcing first operated Woodford well drilled ahead of schedule and under budget. Took 14 days vs 23 day plan. Saying they were within 1.5 " of planned lateral depth. Plan is to frac both this well and the sister Miss Lime well in late May. – hedged at maximum allowed under credit agreement, will add more hedges upon new bank line redetermination in October. Z: Thanks for all your work on today's earnimgspalooza. re 12 – great thanks, tell your golf buddies. Q&A notes from EOX in a bit. A) Offset operator experience. Easy Rider EUR went from 450 to 550 MBOE. Low Rider went to 600 MBOE, that's probably conservative. – were also given confidence to go to 8 m Bakken and 4 TFS wells per DSU (drilled from 2 pads) by having fully downspaced at Caper and Excaliber – little to no communication (6 wells in each) … plan is to drill 3 to 4 wells out of the gate, batch drilled. Q) 4th rig – 1 net well assumed this year, may not get completed this year, will run a 4th rig all next year. Q) LOE improvements – more room to improve? A) Yes, just electrifying Low Rider, changing over from diesel to natural gas has brought the reduction so far, then from natural gas to electricity. Also a centralized natural gas compression facility will help. A) Will use 1 or 2 spreads going forward. A) first well comes online from Easy Rider in June, rig #3 has moved to Prong Horn to begin program there. A) Continue to use $10 off WTI for now … can go either rail or pipe from Enbridge offtake. Seeing more pipelines inside of the Basin being built. So no problem getting it to whichever market is paying best. A) value of the non-op has continued to rise, our sense is that it's best to not sell it but hold onto it for swaps, would monetize for right price, has a pretty high value though since a lot of it is adjacent to operated acreage. A) slickwater fracs working well for us, reluctant to change to cemented liners yet but will have more data in the next few months. Call over, mildly positive tone. There was a little incredulity on the part of sellside guys regarding the decision to step up the spacing assumptions but management handled it pretty well. As per post, 2015 numbers are going to be headed higher, will have a new model out here late this week or early next. EOX- management seems sharp!!! just a qualitative impression. re 15 – yeah, not first rodeo there, this is the most straight forward non-op to operated story in the Basin. ROSE has found solid support in the 41-42 range since 2012, so i don't see it crashing much further beyond where it traded premarket at 43. CRZO, EOG, OAS opening well on their quarters. EOX a little tentative but that's to be expected given size and a bit of a negative opening to the day. EOG and CRZO calls in 30 minutes (10 am EST). I'll be on EOG and then will circle back to CRZO this afternoon. re 18 – and that's really a miss on the sellside's part, the quarter was good. Pleased with the rebound open in OAS. Last trading position added there at the time of the weakness surrounding the 4Q13 report, remains a top 3 ZLT position. Anybody look at this Sabine FST merger deal? Z, now that the Q1 reports are out and analysts are making there adjustments, when do you see it as a good time to book profits. Oil inventories in the Gulf are not getting any smaller, May is here, and many of these E&P names have had a good run. "If your are long on crude, I am sorry for you" —Jeff Gundlach (yesterday) At the Sohn Conf yesterday another big PM came out bearish WTI, but liked Brent. Recommended VLO, MPC. CRZO marching with 5 minutes until their call. re 24 – not more than as noted above. I'll look at the pro forma later but it's hard to imagine there is a lot of asset value over debt in that deal. re 25 – We've been noting occasionally for about 4 weeks now that we plan to raise 10 to 15% cash as quarter end approaches, not Cores but some Trading positions will go. We did our buying of Trading adds quite awhile back now and we'll peel some of that back likely next week. re 25 – and his statement, wondering how long he's been voicing that view? Opening gaps getting a least partially filled on broad market tepidness. EOG notes in a bit. Brodway, hear ya re ROSE adds, will listen first. – Niobrara – AT ROR of 40%, see plenty of upside to that, 13 net wells. Completing first long lateral well now. – won't be another EFS but the plays announced yesterday are impactful. – number of IPs > 4,000 BOEpd … PVA you can do it! – think they can increase EFS production on current productivity and well costs through 2014 and stay in free cash flow land for this segment this year and each year for the next 10 years. – completion costs falling a they use own sand. 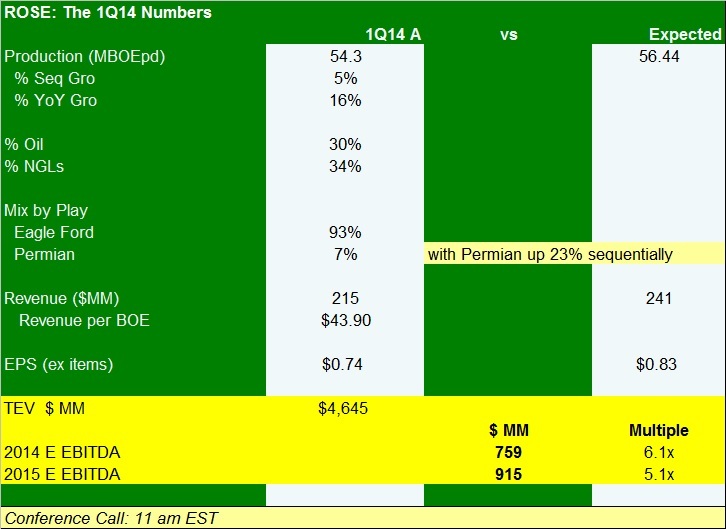 PDC Energy (PDCE): Q1 EPS of $0.27 misses by $0.09. Revenue of $130.26M (+81.3% Y/Y) misses by $4.59M. – in 2018 expect a big batch of LNG plants to start up. 4) testing downspacing in the Bakken, Leonard, and Wolf Camp. re 33 – thanks, lost those guys in the mix, will try to have a look later. EOG: These guys are really good. Can someone take and relay notes on the GDP call?, for 4 at once at that time, and I'll probably be on the ROSE call, if not that then the OAS call. Thanks. Q) capital allocation given the high IRRs you have now. On the EFS that's making the cut off of 60% IRR that are not included in the drilling inventory – they are woking to get those costs down, productivity up, not a big focus, not drilling a lot of those more non core EFS wells but they are doing some work on it. A) will not talk about new plays until we feel we have captured the sweet spots. Q) EFS post HBP (mid 2014) – how do efficiency gains translate after that. Can you quantify? With, like, numbers? A) We have lots of well control, we believe we have defined the sweet spots, set up by the basin architechure, we believe our mapping on our acreage will lead to more consistent than historic results. A) We are mildly bullish on near term gas, we think it will be in the $4.50 to $5. We still don't want to invest any $ in dry gas drilling. We want to see what other operators are going to do at these gas prices. There is the potential for people to drill a lot of wells (and crunk gas prices) and so we want to see $5.50+ and that it would stay around for multiple years before we thought of drilling for dry gas. Good answer. A) We remain bullish on light oil prices, we see a tight supply worldwide, we don't see a pending crisis in the US to process all that oil. Hmmm. We continue to reinvest in US oil projects. Focus EFS, Bakken then the other plays. Focus will be oil for quite some time. They see fairly consistent oil growth (for EOG). Q) where is the EFS acreage that's not in the location count? A) all of it is in the oil window. It's in areas with more geohazards (faulting), forces them to work to get the frac more evenly distributed (frac containment, differing lateral directions). Not low hanging fruit. A) Not yet, still early in the downspacing stage. Until we figure out the formula we are hesitant to try to provide guidance on that. Will be working more on it. A) NGLs kind of go along with the gas, hopeful NGL demand firms up enough to help out on pricing, but we are focused on oil for the next several years. Those combo plays will become competitive down the road but near term, it's oil. A) Parkman and Turner partially overlap, both are sands, mapped it out. Midstream in place to get oil to market. Q) First EFS potential; do the plays today have that upside potential. – no, they are sands (Parkman, Turner, Codell) not shale plays (Nio is a shale) – there is upside potential based on downspacing but they are not going to be (singly or combined) the next EFS. A) not much, a little tightening on drilling rigs, maybe up 5%, but otherwise, very locked in. There is some on trucking but that's why we put in the liquids gathering system on there new plays as they have long term potential. Thanks for the retweets and refferals on today's post. A) For sandstones, they will be a bit smaller, shales large – but focus on sweet spot. Didn't address how small they can go and still move the needle for a company of their size (smaller may =not worth doing from a gathering and local office standpoint). Play potential – we do see opportunities out there still, working on some now, but not the EFS sized ones. Z 34 On the EOG macro notes re oil where they say US slowing. Is that the US economy slowing or US oil production slowing? re 42 – that was oil production rate of growth. – Gates Ranch – Upper Eagle Ford – 3 Upper EFS tests, one on a year now, one on 9 months. 43 If they are correct, I don't think that is a consensus view of the street. Pilot 2 – South Gates – also upper not detracting from the existing lower EFS, also below. .
Will soon be testing Bricsoe and ——-where the section is thicker. – increasing horizontal location count (exludes Bone 1 and 2 and Avalon as being lower pressure and the WC D (cline) for now although they like the pressure. Location count upgrade shown on slide 18. Noting some big offset operator wells through the middle of their acreage. A) on the lower ones now, the lower EFS is higher quality rock in the Gates area. Porosity just not as good, Noting the better wells was lower in the section, getting better height growth into the unstimulated. In the areas where the upper is thicker, it's going to work better. Briscoe – thickness is 260' that's unstimulated. Likely sellside guys going to go both ways on talking about ROSE's upper EFS comments. To me it sounds like it's going to work (very likely in the thck) and some areas just won't get them. The lower results in Pilots 1 and 2 not a bad thing, will take another couple of quarters to get a lower landing upper EFS down. Name should recover some but you may see some guys call the upper EFS disappointing and that's a premature comment in my view. ROSE – Added a Trading positon in ROSE at $44.55 on a quarterly miss weakness (off a little over 6% at present), call ongoing, guidance remains intact, Upper Eagle Ford shows tentative promise, Permian increasingly interesting. Street got the shape of the quarter vs the year wrong. Please comments in post for details. REN getting some love (+5%) with the Frontier/Turner comments from EOG. They recently drilled their first well that IPd at 1134 boepd in the Turner. They also have some nice Permian wells. A) load recovery, then gas break through, then oil startings coming as frac load falls off and pressure rises, they then go into the life of the well to get the 7 day rate average (probably starts about 20 or 30 days in) when pressure is no longer rising. Same goes for the 30 day rate (so it's not the first 7 or frst 30 days), he's just clarifiying. So moving to the Sam Bass well, the unstabilized rate noted in post, completed the well normally in the WC A. Area was naturally fractured and had faults, and produced water from lower zones along (B,C), saying they thought they could have a chance to produce that from the east side, now have a jet pump in and will adjust fracs to try and not get that contribution in future wells on the east side of their acreage. Trying to figure out if being updip is giving more gassy or if they are not getting the oil due to the water contribution. So will try to not frac into the B, C … did note it was not a big area, just a few sections. Oh, 3 or 4 sections. Not sure why I just typed that paragraph. A) We front end loaded the 2014 capital program for two reasons: a) if you look at a Gates Ranch lease map, we turned the row and so we had to shut in a bunch of wells to add the new row. This was the first time we started completing wells on the 3rd row. So we are shutting in twice as many wells to shut in the same geographic area. (look at their lease map in the slides (slide 7 is a good one for this). Then noting they brought on more Tom Hanks wells (those are about 1/2 of a GR area well so it's a lot of moving piece. Later in the year, as they shut in row 2 wells at GR to complete new 3 row area wells they will be shutting in lower rate wells. It's not as confusing as that sounds but don't try saying it 3 times fast. Call over. Tone was good. Somebody jumped the gun and hit the squawk box right after I add that Trading postion. As a reminder, our Cores are taken with the thought of a 2 to 3 year hold and our Trading Positions are taken with 3 to 9 months in mind. re 52 – thanks for that, had not bothered to think about who were the PRB play love beneficiaries yet of the EOG new venture adds. We've done a couple of write ups on REN (see pull down menu) but it's been awhile. EOX – SunTrust cuts target by $0.50 to $9, post call, guess would be the higher capex without significant further increase in the guidance as they only came up to match the Street with the new 3,700 BOEpd. Pssstttt … hey, you, SunTrust guy, they're bagging you, you do get that, right? Will move to the first available replay between OAS and CRZO next. Re 56 – Z, if you have the SunTrust note, would you mind forwarding it to me? re 58 – I don't have it, just the headline. I think SM Energy has acreage over in the powder river by EOG's new discoveries. Re 59 – K, I'll see if I can track it down, not likely as I don't know anyone who gets their research. Re 55: It would be nice if SWN found one of those to build liquids growth. How about the Sand Wash? re 62 – too early to say, will know a lot more by 3Q14 pr. notes on OAS in a few minutes. Re EOX – I can't understand for the life of me why the sellside doesn't get the story. The production story is as simple as A+B=C. Does it really matter if a handful of wells come online January next year as opposed to December? SS targets for such a quickly growing biz seem awfully arbitrary. – will test in the White Unit, south of Foreman Butte, 7 wells with slickwater and be a partial spacing test with wells in the m Bakken and then TFS 1, 2, 3. – about 40% will plan with the proppant amount, mix, and CT delivery of fracs – will release results later this year. – 4 more wells have not been included as they have not yet got 30 days, but looking good so far. Only had a $68 mm outspend this quarter … getting closer to FCF. A) $1.5 to $2 mm for the slickwater. Q) capex was on base frac design so going up? A) bulk of these jobs will be in 2H14 so mostly a 2015 issue but could be some drift up on 2014. A) As we do more we can reduce it, biggest issue is handling the much higher fluid volumes (like 3x more water to source, handle, and dispose of). A) don't have enough data, some better some worse than each other, kind of treating as the same at this point. A) Sand – there was a period in the winter where getting it to wells was challenged but that was due to the rail, there were some bottlenecks, led to a bit of extra waiting time, as weather has gotten better deliveries have gotten back on time. Longer term we don't see a tightness in supply from the mines, issues have been logistics, not concerned about our sand costs. Service costs – supply in decent shape for frac crews and rigs at least for the next 6 to 12 months. A) using ceramic, same amount of proppant but 4x the fluid. Q) how much cemented liner and CT work have you been doing? A) we've done a number of tests (probably 5 to 8 wells) in the past, we have 11 planned for this year. A) nice warm up in April, frost is effectively out of the ground, had a couple of days of road bans due to a snow /rain storm last week, but expect road restrictions to come off everyone by end of month and the weather really has not hampered them much at all this Spring. Getting on the CRZO replay in a minute. Notes to follow. mostly reading the pr operations update so far. Next call look for #s on a) EFS downspacing 330' spaced wells b) 40 acre spaced Nio c) stacked in Nio, and d) an upper Marcellus test. Got asked via email, yes, Zorg is on vacation. Is the slickwater frack something new? Any color on what is different? Q) EFS acreage adds – La Salle, pricing. A) All 5,500 were in LaSalle, only 1,500 adds since last call, prices are $2 to $4,000 , bolt on acreage, not easy for others to use given where it's at. A) it's the north central part of Guernsey, not geologically worried about it all despite a lack of wells in the area, we know how thick it is and what the porosity is. Acrage in the condensate area (buying some now) but ranges from $3,500 to $12,500 per acre (and there's one company that will pay more than that … hello Aubrey). Also have brokers looking for acreage in the dry gas window. A) $10.1 mm but that's also roads and pad, actually drilled well, drilled very fast in the lateral. A) Most of the EOG stuff in downspacing is to the northeast in Karnes and Gonzales. We're looking at all the local data of 330' pilots (EPE most active around their acreage – that's one that IPO'd not that long ago and we passed on it), and CHK. Lots of sand questions/worries on calls today … all met with a big "no problem"
re 75 – not new, been around awhile, more water no gel. It's still going to have chemicals that speed the water into the fracture, and surfactants and biocides but its just a lot more water. Curious if these companies reporting today are ones likely to be using FTK's CnF? If so, is it mentioned on the calls? re 78 – It's possble. PXD does use it in the Permian and we know its in the other basins. No one mentions it by name. 79 I ask every E&P mgt about their use of or opinion of CnF. Very few are willing to comment though most have heard of it at this point. PVA: did you see any read through for PVA on the EOG results? Q) Niobrara and other ? A) Have done some A's, and have some C to test, our Codell may be too thin to test … of course if they have Carlyse underneath as BCEI has been talking about then the Codell may still be interesting down to some very thin slices. A) comfortable Nio B at 60 ac is going to work and also thinking the 330' spaced EFS wells will work but want to have own data before running faster. Sidebar – every call has had at least one question re service price inflation. – their answer – No, prices are pretty flat. Amazing the group think spreads from call to call to call even as all the E&Ps say, "ummm, nooo". Don't want to go faster in the Nio now since the returns are lower than their EFS and they don't know the right spacing is. Sounds like they are going to beat on the gas side this year, sounds a bit conservative on that for midstream constaints that are getting alleviated … and that's more of a rounding error thing in terms of pushing estimates up. If we see outperformance on volumes or price driving higher cash flow we would probably pull the EFS well backlog down a little faster. We could add a rig but that sounds like a decision that will be for 2015. – 2nd well, frac in July, rest 60 days, then extended test so maybe an IP on the 3Q call. Guy (not sure who is) asking about uncertainty around the Brown well – updip to what's been drilled, pretty confident it's going to work, but in the Utica, it could produce too much condensate and not enough gas to be economic (not enough gas to drive it). Tone positive, a bit tired sounding out of the sellside. Estimates will be going up on the beat and on the guidance increase. Ended by highlighting all the good stuff on the call (Nio 60's work, strong Rector well – said it might be the best condensate well in the Utica so far, noted the increase in the revolver that remains untapped). As with all calls, every sellside guy wants them to run faster (despite the 54% oil growth in the name this year) and would, at a later date once they have indeed racked up more debt growing faster then fault them for that. I like the lack of rush and getting it right on spacing (always) before you really try to run fast. thanks RMD. Why do they play so close to the vest re CnF? re 82 – only the usual thought that they are just right over there, in the same county, with much bigger IPs. But the rock vaires across the county and we've talked with PVA and they don't seem to think they are sitting on that same sweet spot to use a phrase over used today. Those EOG wells are way on the high end of the range for EOG at likely over 1 mm barrels. But, at the same time, PVA has come up in terms of early time rates and that's been driving growth faster than many expected. The PVA call, next week, is going to be highlighting those stacked tests with the Upper and its deeper there than what ROSE was talking about this morning to the southwest and the first of those was intersting after the initial reading so it will be very interesting to see what a couple more look like and what PVA decides to say at that point about location count increases as they move to (maybe) two produceable zones in the EFS over a good chunk of their position. Where can I find who all reports this week? Sorry z I know you've pointed this out but on my phone can't find it. anyone have a clue what was said on the GDP call? I plan on listening to it tonight when I have a chance and will pass on anything of value I think. RE 85: Thanks. Look forward to their call. re GDP – stock has a large gap below it that Z mentioned was left behind on the sudden run up. I sold my position higher than here with hesitance and luck and am looking to redeploy long capital lower if things keep moving forward. I'd like to see that gap fill though first. Surprising resilience in nat gas pricing. My KOLD trade has been straddling profitability. re 87 – about to get on the replay of that call, will have notes in a bit. GDP – new wells are expanding the outline of the TMS. Think that they have solved the problem of going through the rubble. Expect that costs will reach 10 m. costs sometime next year. will have three wells fracked this month. Stock will jump if they get positive results out of them. – 10 to 15 degree angle change in the lateral has reduced amount of time they are in the rubble zone, allowing the landing in the lower target, then using drillable composite frac plugs, and have not had the casing deformation issues seen earlier. As always, everyone is sharing to come up with best practices. – Blades – tweaks made increased BOE per Linear foot. Saying the results have been consistent and that the variance in wells has been landing zone related. – expect well costs to continue to fall as they shave sput to TD times, then pad drilling on a limited basis beginning soon, moving eventually towards $10 mm CWC. – further extension to the west being drilled now with the SLC, Inc well (not all that far from HK's Horeseshoe well which is completing now and which we may hear more about later this week from HK). A) open to how it might be structured, lots of options to do all or part of their postion. Would like to see a handful more of TMS wells completed before they go into the JV process probably starting in July. On a ramp up in production from the TMS – 1 week to frac, 1 week to drill out plugs, 1 week to hit peak production … he's pointing to a 3Q ramp in corporate volumes from this. A) 2015 timing is reasonable. Will be doing 2 well pads and some 3 pads. Z- you sure make some great calls on earnings day. Worth the price of admission. If you just happened on the site today by accident. Get a subscription, it will be the best investment you can make. OAS – later day move, SunTrust ups target by $7 to $59, stays at Buy. Have to get on a call will listen to last 30 minutes of the GDP call after the close. Interesting but margin utility of each additional question is falling. After the close we get MTDR and much anticipated ATHL. WPX before the open. Z. do you think GDP has cracked the code on the TMS and does your gut tell you it will work? re 100 – yeah, probably. It's the EFS but in MS and LA and a good bit deeper. Delineating extent of the part of the play that it makes sense under the current and project cost regime with prices somewhere in the current ballpark is next and honing (further) completion mix and then spacing and then development mode. I would not be surprised if it takes long than 2015 to get to $10 mm CWC and I would not be surprised if someone else got there first but since they are all sharing that's fine too. Beerthirty, back in a bit with MTDR and ATHL. PXD numbers look good. Hope another General leads the troops higher. Ahead of guidance and Street for oil volumes, light to the Street on total due to shut ins and timing issues for natrual gas wells. EPS ex items of $0.30 vs $0.28 Street. Guiding full year up due to oil moving to top end of their range, new EBITDA range for 2014 is above current Street. Estimates will be traveling higher. WPX on the tape selling some Piceance working interests to LGCY for $355 mm plus incentive distribution units. Well that's one way to monetize without creating an MLP yourself. re 99 – Z, when you said margin utility of each additional question is falling, what exactly do you mean? My first guess is that each question is uncovering less and less value and/or data points? re 106 – yep. Will still listen to the back end of the call but a lot of the questions were pretty rote at about 45 minutes into the call. EPS of $0.21 vs $0.03 consensus. Oil was higher than expected, Williston and SJB driving. Operational details in the morning post. wow am i glad i didn't rush to have sold off my position. that is quite a beat on both the revenue and earnings per share side. the new management will have a tall order keeping up with those kind of beats. NOG sneakily up on the day with very good volume. One day…..
EIA estimates U.S. total crude oil production averaged 8.3 million barrels/day (bbl/d) in April 2014, which would be the highest monthly average production since March 1988. U.S. total crude oil production, which averaged 7.4 million bbl/d in 2013, is expected to increase to 8.5 million bbl/d in 2014 and 9.2 million bbl/d in 2015. The 2015 forecast represents the highest annual average level of production since 1972.